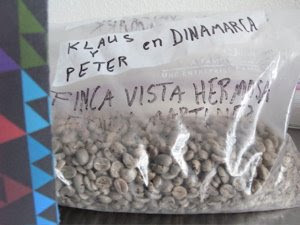 You may have noticed a link to the right side on our blog which says Finca Vista Hermosa. Finca Vista Hermosa is a coffeefarm in Guatemala and has a very special meaning for us. It is mangaged by som really dedicated people. Our most close contact has been with the son of the owner - Edwin Martinez, but like all good farms, it is a place that has its greatness due to many many people with different skills. The first lot of coffee we have bought to The Coffee Collective is from Finca Vista Hermosa. It is now on its way over the atlantic to Copenhagen. From our cupping of the samples, we have great expectations to this lot - we believe we will use it both as single estate coffee and as part of our espresso blend. We will post a lot more information about Finca Vista Hermosa and Edwin as our webpage develops - for now we are just looking very much forward to having their coffee in-house and to start working with it in respect of all the work they already have put into it! its in swedish but I guess most of you will understand anyway! Thanks a lot for the response. It's so nice to hear from customers and get some feedback. We hope to be able to have lower shipping cost to Sweden in the future and also an english version of the webshop (and a Danish of the website...). Hope you enjoy the coffee!